Perfect for a couples retreat or a honeymooners escape, Panorama is an exquisite property with much to offer! 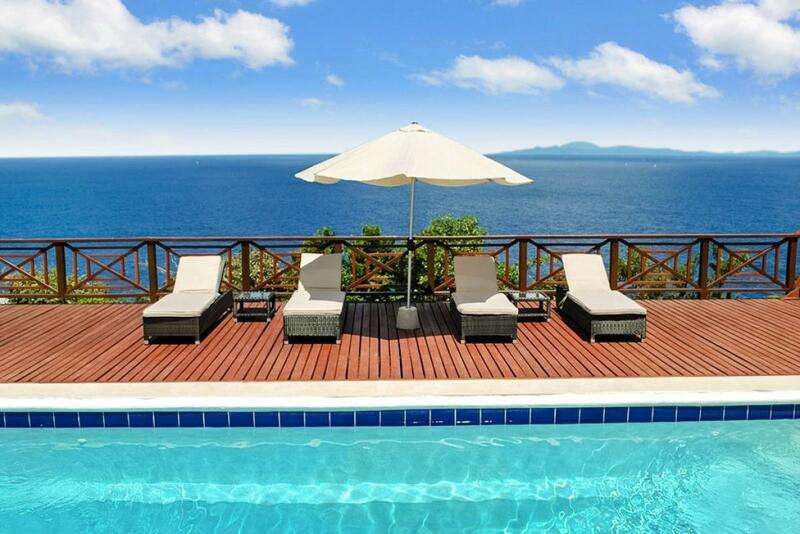 This two bedroom villa includes contemporary furnishings, a large pool, sunset views and more. Both bedrooms feature king sized beds, en-suite bathrooms and lead to the spacious outside deck where you can enjoy a glass of lemonade poolside. Rodney Bay is just 5 minutes away, with a great grocery store, restaurants, shops and tour operators to help you with the many available island adventures. As you enter Villa Panorama you are greeted by the stunning sea view that leads all the way to the island of Martinique. The superior comfort and design is combined with a range of facilities, amenities and services that you would expect from such an exquisite villa. Each of the two bedrooms feature King Size beds with Egyptian cotton bedding, in ceiling air conditioning, stunning en suites with Kohler fittings, premium bathroom amenities, and personal bathrobes. Each of the two bedrooms open out onto the private furnished deck area with access to the swimming pool. The air conditioned lounge/dining area includes Sony flat screen, Apple TV, Wifi and sound docks for your own music and films which can be enjoyed whilst relaxing on the exclusive sofas, designed and handmade in the UK. A fully equipped European kitchen means dining at home can be a memorable experience with a choice of interior or al fresco dining beneath the star filled skies of St Lucia. For your additional comfort whilst on holiday, the Villa comes with your personal housekeeper. Chef services can be arranged at an additional fee if required. The Villa at Panorama epitomises luxury living at its best. Relax & enjoy the natural beauty of the location goes a long way in making your holiday memorable and we want to ensure that everything you need is at your fingertips to make it extra special. Our concierge service provides professional concierge and lifestyle services so that you can relax, unwind and indulge yourself in the St. Lucian lifestyle. St. Lucia has an abundance of activities that our concierge can arrange for you. If you are feeling slightly more energetic then why not explore the Piton World Heritage site and rainforest where you will find the Botanical Gardens, Sulphur Springs and beautiful water falls. If you enjoy being out on the sea then sailing down the wonderful St Lucian coast is not to be missed or just enjoy sun down out in Rodney Bay - you may even catch site of the Dolphins or Whales that bless our coastline. Whatever you decide we want you to have the best possible experiences and times whilst staying at Panorama. Housekeeping service twice weekly included. Additional maid and cook service can be made available at an additional fee. Please note that our housekeepers are not trained nannies and should not be expected to look after and/or babysit infants and children. If you do make babysitting arrangements with the staff, please be advised this is at your own risk. Rental Notes - Audio/Visual entertainment room with 55” plasma screen. - Both bedrooms en-suite with air-conditioning. - 10 ft deep, 30,000 gallon swimming pool. - Truly magnificent views throughout. 4 - 10 ft. deep, 30,000 gallon swimming pool! Anse Du Cap beach is 5 mins drive away. We had a wonderful stay at Panorama. The views from the villa are breathtaking and we found ourselves hurrying home each evening just to catch the sunset! The house is well kept and Marguritte and Michele were very helpful. Cap Estate is located within a 10 min drive to beaches, restaurants and grocery stores. We will definitely visit Panorama again.